“Oslo” is the story of husband-and-wife Norwegian diplomats who organized secret, unofficial peace negotiations between Israel and the Palestine Liberation Organization in the early 1990s. 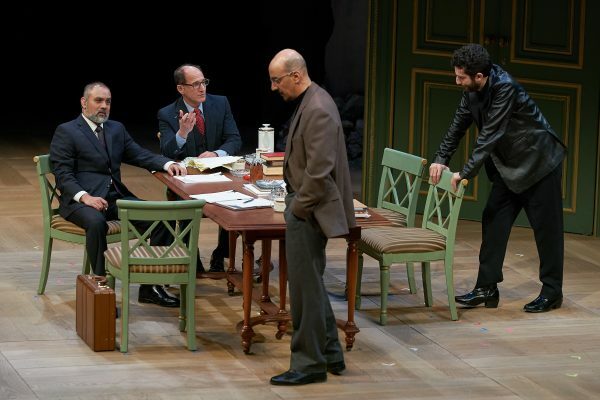 The play, by JT Rogers, is based on real meetings that took place without the knowledge of the US government, which was holding simultaneous “official” talks that were going nowhere. Considering that various groups from that part of the world have been fighting for decades, the hope for reaching an agreement was slim — and yet, the covert conversation bore fruit. For a little while, anyway. The St. Louis Rep’s production of the play — which won all sorts of awards in New York in 2016-17 — is a wonder to behold, partly because of Rogers’ words, but mostly because of the performances of the cast of more than a dozen actors. Of those, Rajesh Bose stands out as the PLO’s finance minister, tasked with representing Yassir Arafat. Jim Poulos and Kathleen Wise are also top-notch as the Norwegian couple who manipulate both parties towards frank discussions and serve as our narrators throughout. Frankly, there’s not a weak spot in the cast, nor in the direction of Steven Woolf, who is stepping down as The Rep’s artistic director after 32 years, leaving quite a legacy of brilliant theater behind. Afterwards, I wished that someone had the power to force our current political leaders into a room and tell them they can’t come out without a peaceful compromise on the most basic issues facing the US. Then again, the result would probably be as short-lived as the principles that Chairman Arafat and Israeli Prime Minister Menachem Begin attached their signatures to on that historic day in 1993. Nonetheless, “Oslo” makes for a gripping theater experience. I give it a 9 out of 10.